In Daniel's vision "little horn" evolves ("waxed great," "magnified himself") to a point where his power casts down and stomps demons. If this "host" were God's good angels little-horn would not have such power over them. "the daily sacrifice was taken away, and the place of his sanctuary was cast down." Take note that this is not the sanctuary but instead "the place of his sanctuary." 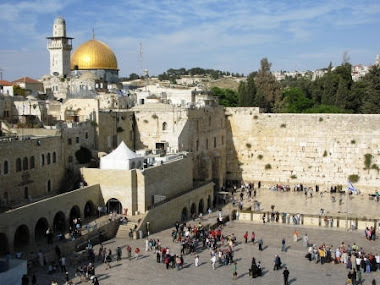 The sanctuary itself was destroyed in 70 AD, of which, only the "wailing wall" remains currently. It seems likely that this "Abomination of Desolation" will be caused by nuclear weapons! "Therefore rejoice, ye heavens, and ye that dwell in them. Woe to the inhabiters of the earth and of the sea! for the devil is come down unto you, having great wrath, because he knoweth that he hath but a short time." "Then I heard one saint speaking, and another saint said unto that certain saint which spake, How long shall be the vision concerning the daily sacrifice, and the transgression of desolation, to give both the sanctuary and the host to be trodden under foot? And he said unto me, Unto two thousand and three hundred days; then shall the sanctuary be cleansed (Dan 8:13-14)." · The antichrist “shall enter peaceably” at the beginning of the 7 years (Dan 11:21&24). · We “shall see the abomination of desolation, spoken of by Daniel the prophet… then shall be great tribulation, such as was not since the beginning of the world to this time, no, nor ever shall be (Matt 24:15-21).” We will have 2300 days until the Lord returns!